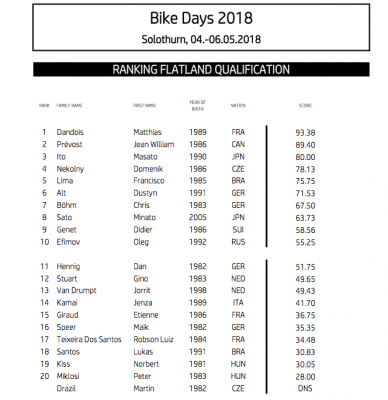 Congratulations to Matthias Dandois who qualified 1st at the Bike Days contest in Solothurn, Switzerland with another flawless performance. Did you know Matthias has not touched in a contest so far this year, that is incredible! Matthias was followed by Jean William Prevost and Masato Ito in the top three, followed by Dominik Nekolny, Francisco Lima from Brazil, Dustyn Alt, Chris Bohm, Minato Sato, Didier Genet, and Oleg Efimov. Live scoring this year at the Bike days. Finals tomorrow at 3pm.